Cook rigatoni to desired doneness as directed on package. Drain; cover to keep warm. Meanwhile, spray large nonstick skillet with nonstick cooking spray. Heat over medium-high heat until hot. Add onion and bell pepper; cook and stir 5 to 6 minutes or until crisp-tender. Add bratwurst and marinara sauce; mix well. Reduce heat to medium-low; cook 5 to 10 minutes or until thoroughly heated, stirring occasionally. 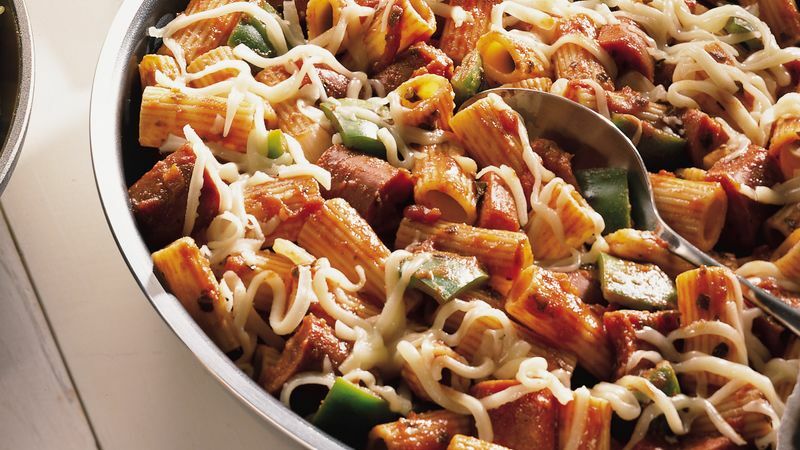 Stir in cooked rigatoni. Sprinkle with cheese. Meatless spaghetti sauce can be used in place of the marinara sauce. Mostaccioli or bow tie pasta can be used in place of the rigatoni. Cook the rigatoni for this recipe in advance. Drain well, then toss it with 1 tablespoon of vegetable oil. Refrigerate it in a resealable food storage plastic bag for up to as day.